In a related story, actress and Bensonhurst native Alyssa Milano disapproves of her state senator with the gilded but tarnished, surname. That follows fellow actor (and fellow Bensonhurster) Vincent D’Onofrio’s opposition to Golden. If you care about the Brooklyn Heights Promenade — and the BQE project that will destroy it (temporarily! ), you have to read Dana Rubinstein’s new piece from Politico. I was, of course, very happy to see New York Magazine give would-be bus fixers Alon Levy and Eric Goldwyn prime op-ed space this week, allowing them to discuss a plan I wrote about in these pages last month. Comptroller Scott Stringer wants to make LIRR and Metro-North trains more appealing to city residents by dropping intra-city fares. ICYMI: The Times did a deep dive on congestion pricing — and quoted the single most important person on the subject, Friend of Streetsblog, Charles Komanoff. And in case you missed this one, too, Forbes also weighed in against the idea of parking-based congestion pricing, arguing that it wouldn’t raise any money from drivers who don’t park. 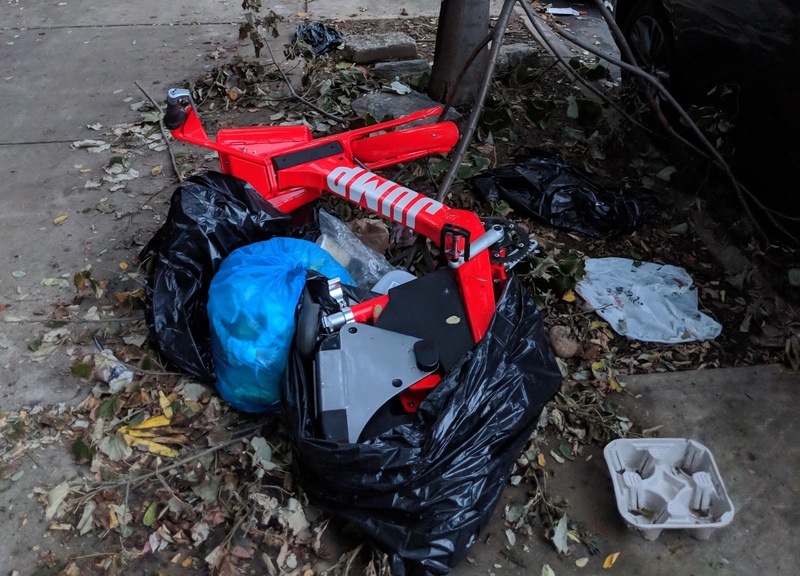 And, finally, Friend of Streetsblog Steve from the Bronx sent us this sad picture of a JUMP bike at Parkside and Webster avenues. Guys, it’s bike share, not bike trash. Still planning to spend 30-plus years of future money up front? The subway action plan won’t mean the subway is “finished.” In 7-10 years when that money is gone, additional vehicles/systems equipment will reach the end of its useful life, and then what? It seems to be that a whole generation of politicians and their minions reached the end of their useful life decades ago. I guess enough of them are still around that they want to find a way to push of disaster for another 7 – 10 years so they can sell any property they have to the suckers and move to Florida. The Trump tax cuts are scheduled to expire in 10 years. Social Security and Medicare are scheduled to run out of money in 11-13 years. I guess they might as well sync all this up so it happens at the same time, far enough from when the deals are cut so it can be described as “due to circumstances beyond our control” by the people they appoint to take their place. Does anyone else, anyone at all, care about the future and those who will live in it? is Dana Rubinstein’s new piece from Politico available for non-Pro people? Social security and medicare can never ever run out of money. The US Federal government is a monetary sovereign, it can literally never run of out of money. All spending choices are political, if a SS suffers a shortfall its because of a political choice. We can allocate whatever money is necessary to cover the line item expense of any government program. Dollars are not the constraint. If you want real world proof of this look at the bank bailouts by the federal reserve or any budget year for the Pentagon. Please stop peddling falsehoods on these boards. If you have an axe to grind against public sector workers then yell into the void somewhere else. The fact that there will be a choice between paying in (or having our children pay in) drastically more, and getting drastically less, or some combination of the two, doesn’t change the allocation of benefits and burdens between the past and the future, those born sooner and those born later. Very much like global warming. And what people said when I yelled into the void about financing ongoing normal replacement for the transit system with debt — 20 years ago. Mark Levine didn’t say WHERE this ferry would leave from in NJ. Problem is, NJ isn’t magic… it’s got this thing called the Palisades. If the ferry leaves from Edgewater or something (most likely), then it will be hard to drive to and hard to park at. NJ drivers will find it’s easier to just drive across the GWB… or park in NJ and take the Jitney Bus along Route 4. If the ferry leaves from Ft. Lee… well, it can’t, unless you build a big elevator to get down to the ferry dock. Once you get to 125 St… unless you work at Columbia’s Manhattanville campus, you have to slog over to the A train. Which would probably involve a bus (??) and be slow? Wouldn’t it be better to just park in NJ, take a bus across the GWB and grab the A train right there at 175 St? Agreed, although there’s also the 1 train before you get to the A at 125. The GWB Bus Terminal is certainly underused. Gene Russianoff warned in the early 1980s that funding the first MTA capital program with bonds would just put pressure on fares and loot into the coffers of the banks and financial firms handling the bonds. Bonding against another additional revenue — AGAIN! – i’s exactly like the Trump tax cuts. Remember the Reagan tax cuts would “cost nothing.” The budget deficit soared. But they still did the Bush II tax cuts, and said it would cost nothing. The Great Recession hit and the federal debt went to the moon. Now the Trump tax cuts. If you just yell loud enough to shout down anyone who objects, that it must be “true.” Even if the harm from doing the same thing in the past is already taking place. It’s one thing to say it “cost nothing” and expect to be believed when the cost is in the future, it’s another to do so even when it is already the present. Discretionary, non-military federal spending is now rounding error. In the early 1980s — up until the Pataki/Giuliani Administrations — most of the MTA capital plan was funded with actual current revenues. At the federal level deficits are meaningless, paying attention to them is also a political choice. Deficit spending only matters or is a problem for social programs that our overlords are ideologically opposed to. The federal government can and does spend whatever it want on programs that benefit those in power. Social Security and Medicare, if they “run out of money” it’s a political choice. There is zero need to ever pay out one penny of those programs using tax revenue. The government can simply allocate whatever the monthly payment is to each beneficiary. Taxes do not fund federal spending under a fiat system. if we went back to the gold standard it would be a different story. At the state and local level deficits matter because states are not monetary sovereigns and have to balance their budgets or make up the shortfall with debt. I’ve said this before, but the feds could wipe away the MTA debt tomorrow with a few keystrokes. They won’t of course and that wouldn’t solve MTA mismanagement and incompetence. but from a fiscal point of view, the debt can be erased. It’s just a political choice. Monetizing past debt doesn’t “cost nothing.” See Argentina. But the way things are going, that may end up being the least awful scenario. Default and not paying is another. It’s not monetizing debt and Argentina is not a monetary sovereign, since it’s on and off pegged its currency to the USD and the majority of its external debt is NOT denominated in pesos. The USG is not going to default barring a cataclysmic event. And in that case the last thing anyone will be worrying about is deficits. Once the US left the gold standard, deficits don’t matter. There is no monetary constraint on spending, only a real resource one. You can allocate $500 million for a bridge but that won’t do anything if you can’t get anyone to build it or don’t have concrete, etc. For now. I said a few years ago that the dollar’s status as a reserve currency is about the only national asset Generation Greed hasn’t cashed in, and down in Washington they’re working on that. After all, The Donald is doing more to unite the almost the whole world than any international actor since — Hitler. Against us, this time. This is why if a congestion tax is passed it should be stipulated that it can’t be used to finance more debt. What happens if the future projections of tax revenue turn out to be too high? The only option at that point is to default on the debt. A congestion tax should be spent as it comes in. You look at the chart of CPI occasionally there were ups and downs but the CPI always corrected itself to an average value somewhere in the 30s from 1800 through WWII. We got off the gold standard in 1933 but the effects didn’t show themselves until the heavy borrowing we did to finance WWII. Look at what happened since then. The CPI ballooned from around 40 after WWII to nearly 600 by 2005. Inflation is bad for lots of reasons. Governments profit off inflation by taxing any investment gains, even if those gains don’t keep up with inflation. Inflation eats away at savings. Those who were frugal and saved their entire lives could see their savings wiped out if the government decides to print money willy nilly. With inflation you can’t plan for large future purchases. For example, if housing prices were stable you would know exactly how many years you need to save if you’re putting aside x dollars per year. Same thing for other expensive items. I can’t even plan for my retirement. I may only need $1,500 a month, or I may need $15,000. No way to know because I don’t know what inflation is going to do. That’s no way to live. That kind of uncertainly puts a damper on economies. We need to go back on a gold standard to force government to live within its means, and to keep prices stable from one generation to the next. Sure, if you have a fiat currency you can never run out of money but you can make people’s savings or debts owed to creditors worthless. To some extent we already did that once in the late 1970s when NYC got out of debt due to rampant inflation. The effects weren’t pretty for those who lived through it, yet that was a mere hint of what would happen if the federal government starting increasing the money supply. So what are the options for people like us, besides putting a gun to our brains? It doesn’t sound like there will be many. I think one solution to the “retirement crisis” is to just lower expectations. Far too many boomers expect a second home and a vacation every few months in their retirement, essentially a “Lifestyles of the Rich and Famous” retirement. My suggestion is to get hobbies which heavily involve you and nix the travel. It’s bad from a global warming perspective, plus it’s just a quick high. I’ve been managing my mom’s money since 2011. Not only is her ~$30K in total pension/SS sufficient to support herself, me, and a few cats, but now I’m even building up a surplus of over $5,000 a year. I don’t see why boomers with paid-up houses need $75K or $100K in retirement unless they insist on living profligate lifestyles which neither their parents nor their grandparents had in retirement. I see default as the best option, rather than inflating your way out of debt. However, I might have a caveat. The bonds a person is holding only go into default if they have a net worth (not including the bonds or your primary residence) of x dollars, where x is a high enough number so anyone less affluent than those somewhat above upper middle class won’t be affected. I might put the number at least at half a million. This won’t wipe out 100% of the debt, but it will wipe out bulk of it which is held by multimillionaires who really won’t miss the money. In a sense it’s even fair. We’re taking from them what really should have been taken over the years in higher taxes. There is certainly a monetary constraint once the value of a dollar is falling fast enough that what you bid on a job might not even cover your costs by the time the job is finished. What will happen in this scenario would most likely be a barter economy. If someone is buying my services, I won’t ask them for dollars which might buy half as much in one month. Rather, I’ll ask for capital goods in return, stuff I can barter for things I need. I think in such a world guns, ammunition, non-perishable foods, solar panels, bicycles, clothing, etc. will be what I would want in payment. Lower your expectations, for one thing. There is a lot of fat that can be cut out of American life without much of a decrease in happiness, but given the nasty people running our declining institutions, I fear that may not be what goes away. Marty Golden Weaponized His City-Issued Parking Placard. Will de Blasio Let Him Get Away With It? Golden has shown himself to be an unrepentant menace behind the windshield. The revocation of his parking placard is the least that should happen to correct his behavior. Golden's support for the speed camera bill should enable it to transcend Albany's partisan gridlock. So far, however, he hasn't delivered. Golden says he wants a special session to enact the speed camera bill, but the proof will be in the actual vote. Will the State Senate Ethics Committee Investigate Marty Golden’s Placard Abuse? New Yorkers are circulating a petition calling on Senate ethics committee chair Elaine Phillips to investigate the incident in which Golden reportedly used his placard to impersonate a police officer and bully a cyclist. Lawyer: Marty Golden Wants to Silence Safe Streets Activists — Enough! A State Senator with a huge war chest goes after a group of lowly activists — a battle with free speech ramifications.